Today, we celebrate the release of Behind the Door (1919), now available on Blu-ray/DVD. 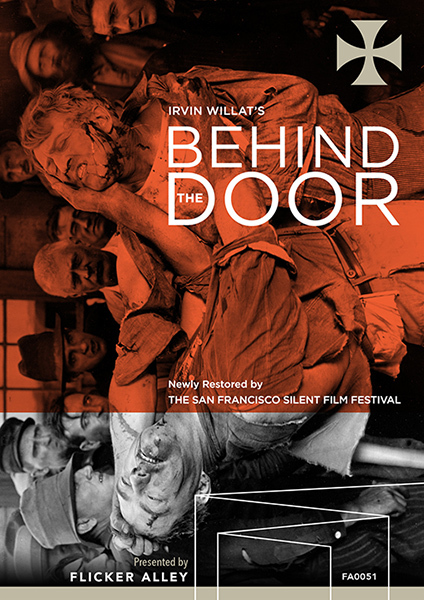 Flicker Alley is proud to present this essay by Marc Wanamaker, in which he discusses the history of Behind the Door and his personal experience meeting its director Irvin Willat. Our gratitude goes to Mr. Wanamaker for graciously providing the production stills from Behind the Door for this piece. Marc Wanamaker is a world-class expert and consultant in film history who has worked in many facets of film production, exhibition, and research for several decades. He is the author of many books on Los Angeles area history and the founder of Bison Archives, a production and research consulting organization for motion picture and television studios and other entities. The film Behind the Door was a sensational hit when it opened in December of 1919. WWI had been over for about a year, but the trauma of the horrors of the war endured in the American memory at the time. When I met Irvin Willat in 1975, the year before his passing, I visited him at his home in West Hollywood, a home that was suspended in film history. The feeling of history was palpable and I was talking to a man who started in the film industry in 1910 acting a part opposite Mary Pickford. Acting was not his style and Irvin pursued his interests in camera and laboratory work, a profession his older brothers were working in as still and motion picture photographers. Over the next few years Irvin worked in film laboratories, built cameras, became an assistant director/manager at several early East Coast studios and a cinematographer with some important directors and films in the mid-teens. 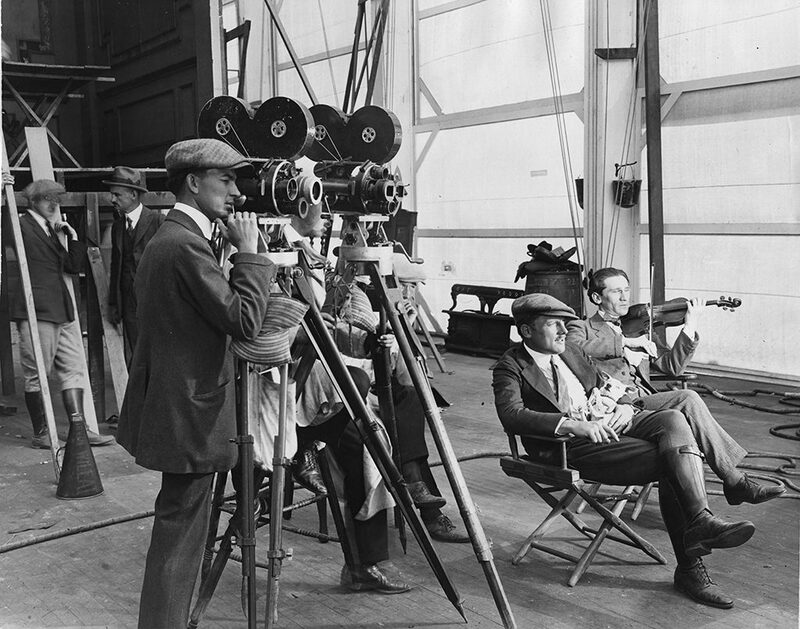 Director Irvin Willat (seated) at the Thomas Ince Studio in Culver City (1919). 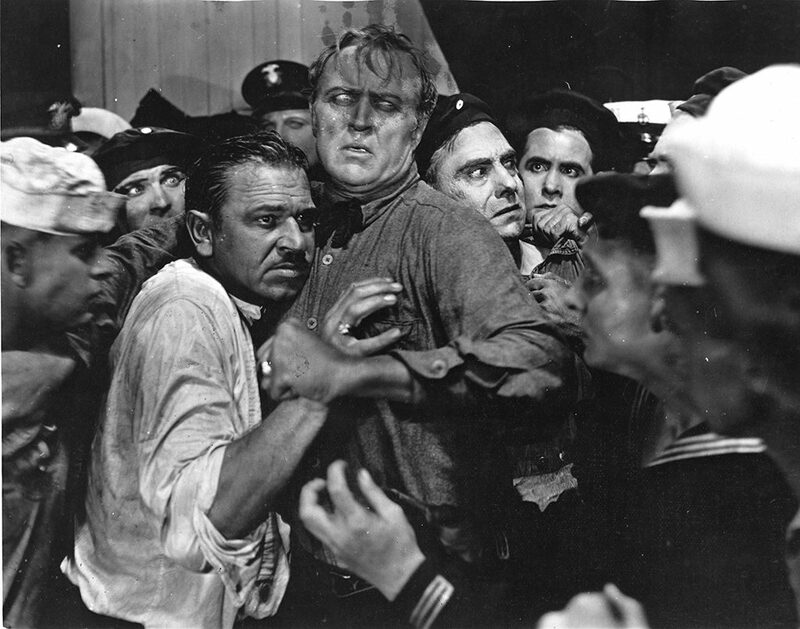 Wallace Beery (left) and Hobart Bosworth (center) in a confrontational scene. Thomas Ince, who produced the film, entered the film industry in 1910 after having worked as an actor on the stage. He worked at the Biograph Company as an actor but wanted to do production work and hoped one day to direct pictures. His chance came after he was working at the IMP Company where he met the young Irvin Willat under the guidance of IMP President Carl Laemmle. Ince was a dynamic director/producer/writer/editor/cameraman, etc., and it wasn’t long before Thomas Ince was one of the leading Producer-Directors in the American film industry. Ince produced and directed Civilization in 1916, an anti-war film which was part of the Hollywood Studios team in support of President Wilson’s policy of staying out of WWI. But when the United States entered WWI, all of Hollywood supported the war effort, including Ince. After the War, the studios were making films about people “healing” from the horror of the war and for better understanding of the German people who were caught up with war fever of that time in Europe. In Behind the Door, Hobart Bosworth plays a taxidermist in a small town and is of German heritage. He is reviled by his own townspeople due to his name and heritage. He fights some of his former friends and enlists in the war effort to show his patriotism. This is the theme of the film and Thomas Ince’s production was to show that Americans are from all nationalities and are patriotic. 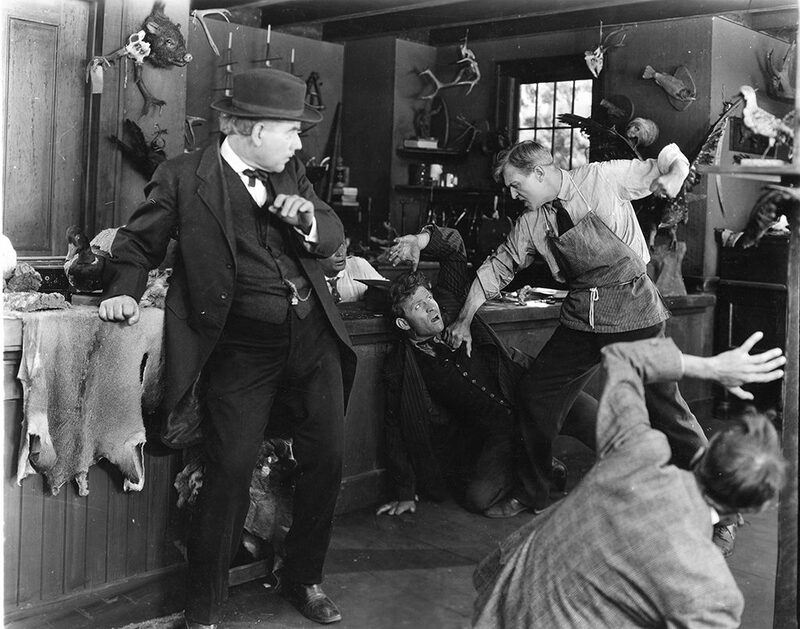 Bosworth films a fight scene when the town turns against Krug for his German descent. Reviews of the film described the plot beginning with “Oscar Krug” (Bosworth) who is looked upon with suspicion by his townsfolk due to his German ancestry. When the United States is drawn into the war with Germany, Krug is targeted. Krug marries a woman (Jane Novak) against her family’s wishes and she is then disinherited. She disguises herself as a nurse and stows away on her new husband’s ship on its way to the war zones. 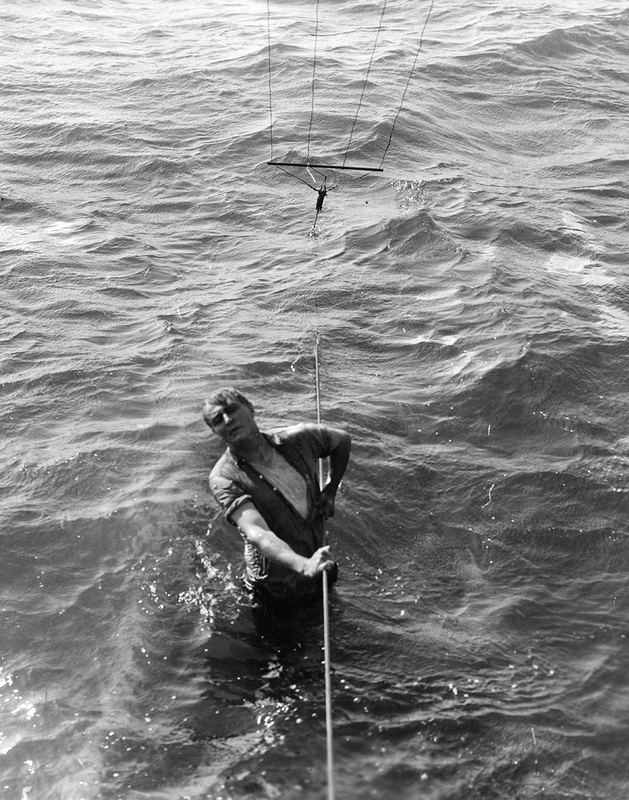 During a German submarine attack, their ship is sunk and she is captured by a German submarine officer who throws Krug into the sea. The takeaways from this film are that the horrors of WWI ruined the lives of many people and that the post-war years would be for healing and respect for the veterans who fought in the Great War. Jane Novak portrays Alice Krug. Pre-War and Post-War in America was pictorialized in many films well into the 1930s. On April 6, 2017, the United States honors the 100-year anniversary of entering WWI. Today there are many documentaries, exhibitions, TV programs, etc. produced and being produced that study the effects of WWI on America, and Behind the Door is an example of what the film industry was doing for audiences at that time. The film is a tragedy about WWI and the people who fought in it. The film industry had several high profile leaders who were of German ancestry at this time. Two important film personalities—Carl Laemmle, the founder of Universal Studios, and Erich von Stroheim, director-producer—had problems with their fellow Americans during the war. Von Stroheim had the worst of it, as he played German soldiers in several films. In his private life he was spat upon and had objects thrown at him. He exclaimed that he was just playing a “part” in a drama, but many people were hateful against German-Americans at that time. The same happened to von Stroheim during WWII as well, especially when he played characters like the German Field Marshal Rommel in Billy Wilder’s Five Graves to Cairo (1943). 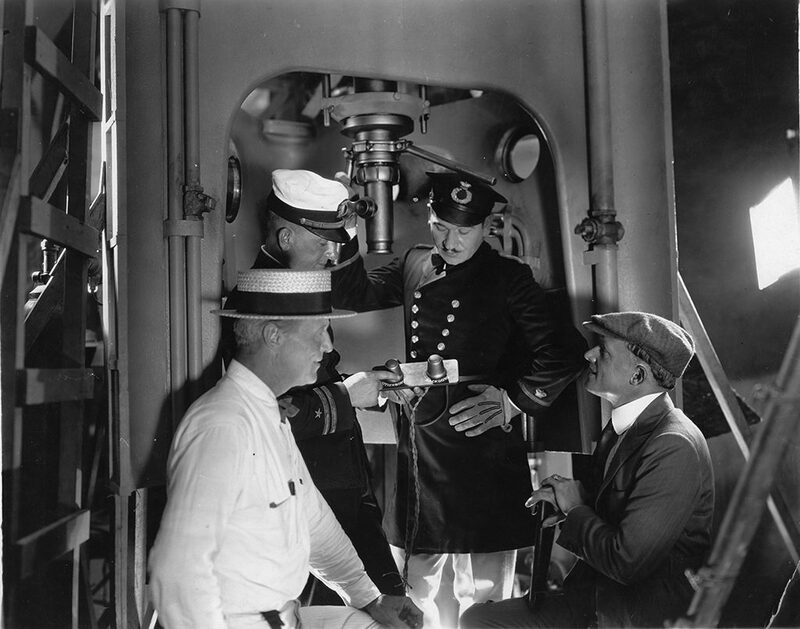 Left to right: actor Hobart Bosworth, technical director Captain John Cook, actor Wallace Beery, and director Irvin Willat on the set of "Behind the Door." 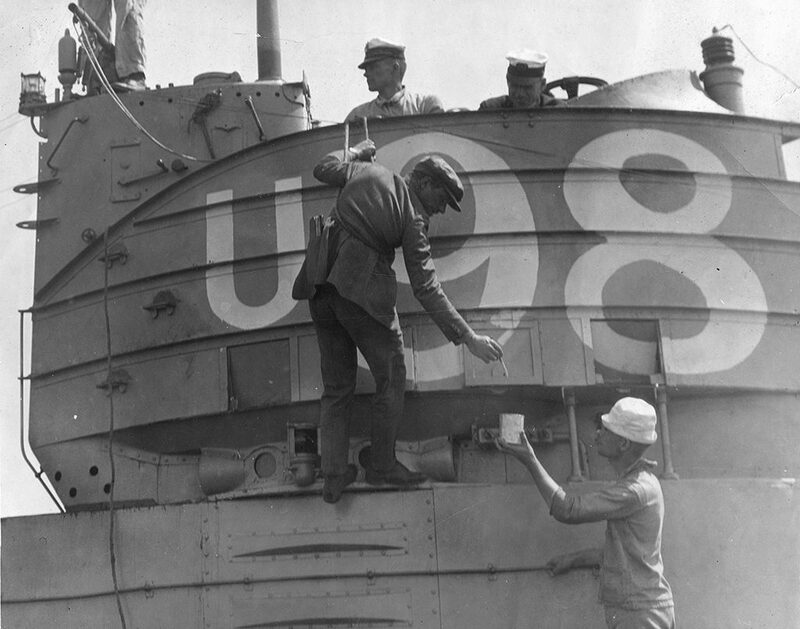 Willat (center) paints a German identification number on an American submarine, to be used in the film as a German U-boat. Hobart Bosworth clings to the deck of a submerging U-boat during filming (a stunt that nearly drowned him). All in all, the intensity of the story, the authentic backgrounds and the performances of the cast bring a tragic story to the screen that still enthralls, horrifies and thrills modern day audiences. The film restoration was completed in May of 2016 by the San Francisco Silent Film Festival in partnership with the Library of Congress and Gosfilmofond of Russia. The new restoration uses all known film elements that bring to the screen most of the film’s impact. Irvin Willat is, for the most part, a forgotten director who was a dynamic personality during the silent era. His family of cameramen and laboratory pioneers were well known in the early days of cinema, especially the eldest brother Carl ‘Doc’ Willat, who built one of the first studios in Fort Lee, New Jersey and was a founder of Technicolor Corporation. 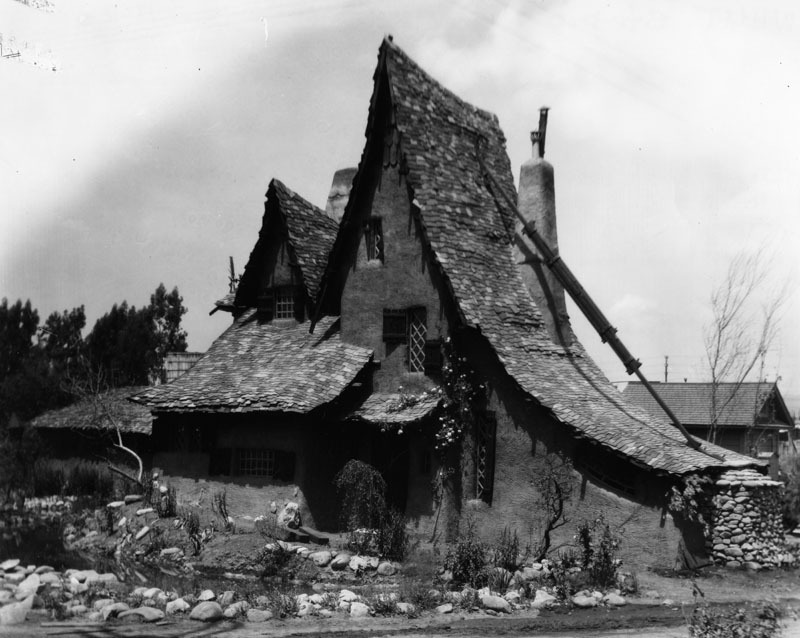 The Witch's House in 1920. Credit: Los Angeles Public Library Photo Collection. After the completion of Behind the Door, Irvin and his brother Carl formed the Willat Film Corporation and began to make a series of films across the street from the Thomas Ince Studios in Culver City. They hired Art Director Harry Oliver who built them a “Fantasy-English Cottage-style” house as their headquarters and proceeded to make four films for Hodkinson Distribution release. Today, the Willat Studio is known as “The Witch’s House” in Beverly Hills. I had the privilege of discovering those four films in Willat’s backyard vault in perfect condition. They are now housed at the Library of Congress. I also found a Technicolor print of Wanderer of the Wasteland (1924), the first Technicolor Western film, but it was totally disintegrated! 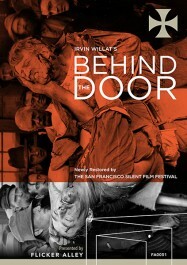 I did not find a print of Behind the Door, one of Willat’s favorite films. This proves that Behind the Door is a rare film to find and I am grateful that the current print exists and that audiences of today can see it. Behind the Door is now available to own on Blu-ray/DVD! Special sale price $29.95 ends on April 11, 2017.